Stitches and Scissors: still here. I always told myself I would only blog when I wanted to and not because I felt I had to. I would hate for it to feel like a job. So I am sorry that I have not been blogging as much as I used to. Erin and I were just talking about all of this the other day and then Megan said it perfectly yesterday on her blog. Dito to everything that she said. 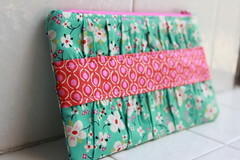 I have been sewing though and being busy with Penelope's birthday and Thanksgiving. 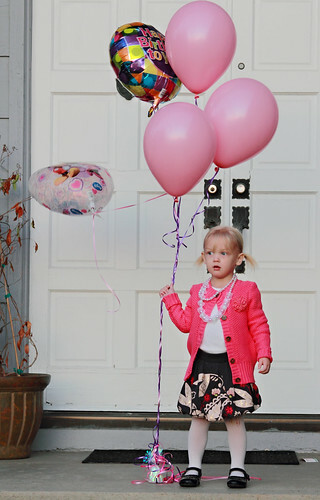 It was Minnie themed since that seems to be her most favorite lately. 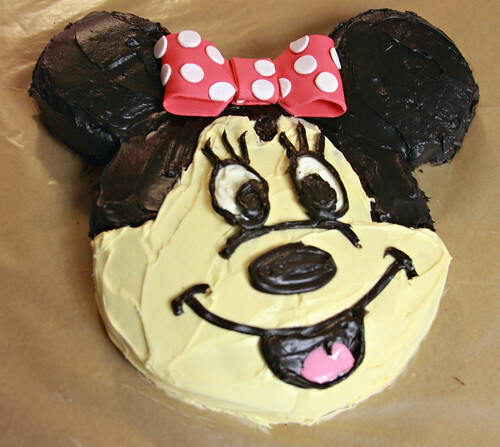 Luckily enough it was an easy cake for me to make since I try to make the girls their cake every year. Then Thanksgiving was here and we went to my in laws for the day. Were I neglected to take any pictures. Terrible. I am getting lazy for sure. 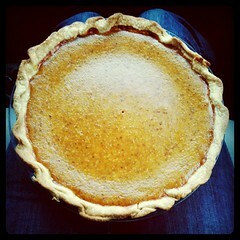 Oh wait I did take a picture of one of the pies I made on my lap on the way to my in laws. I do love homemade pies way better then store bought. Apparently all I was thinking about was Pumpkin Pie that day, can you blame me? 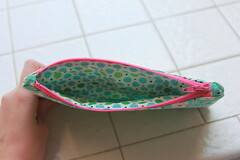 I sewed a couple of the great gathered clutches for a friend. One for an auction to benefit her mommy group and the other for her. Where I finally achieved perfect zipper ends thanks to this diagram. Don't sew on the ends at all!!! Who knew. 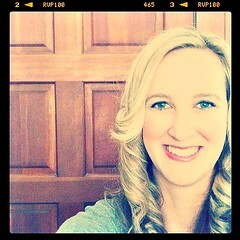 I had a good hair day. I had to take a picture to document. I went to Disneyland to meet Jen from Mjandco! I was so excited to meet her in person finally after knowing eachother forever on flickr. We did a little fabric swap she was awesome to offer me a piece of the Mermaid fabric that I am collecting to make Gweniveve a quilt. The kids got along great and even though it was crowded we had a great time. I have been sewing alot of the small things I have on my list since I wanted to get them out of the way before my parents get here ( on Monday!) 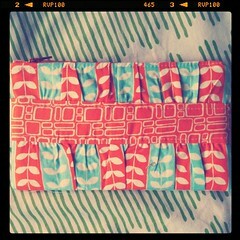 so that my Mom and I can sew all the big things on my list. I will be back tomorrow with that post. I hope everyone had an awesome Thanksgiving and you are all hanging out with your family and having fun. 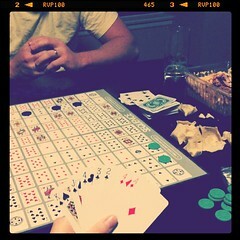 I love to play games and lucky for me I have a husband who plays them with me. 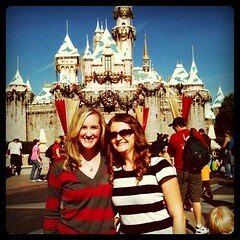 Ahhh, Disneyland. How fun. We spent 4 days there this summer with our kids for the first time and it was awesome! Crazy packed but we had a great time. yay for moms coming to stay! enjoy your family time!